Bowmore is one of those distilleries our merry malt group has barely scratched the surface exploring. Naturally, we skipped past all the entry level Bowmore’s and went straight for the mighty 21 year! As usual, we tasted blind and were delighted to learn we were spot on about the whisky being matured in Port Wood casks. This version of the Bowmore 21 was released in 2009 with 7,200 bottles. While it had higher alcohol content than initially apparent, our initial reaction a reasonably enjoyable dram to sip and savour when in the mood for something of this character. What caught me completely by surprise later is the current price tag… hovering around $400 – 550? Now… I don’t know about you, but that’s getting into the steep territory and a price point where I demand something pretty exceptional. Though this is certainly a worthy dram, am not convinced it is worth such a price tag. However it certainly wouldn’t dissuade me from trying more Bowmores… far from it. In fact… I have a Bowmore Laimrig 15 year awaiting its turn to be sniffed, sipped and considered. Would the 21 year fit this description? Yup… it would indeed. 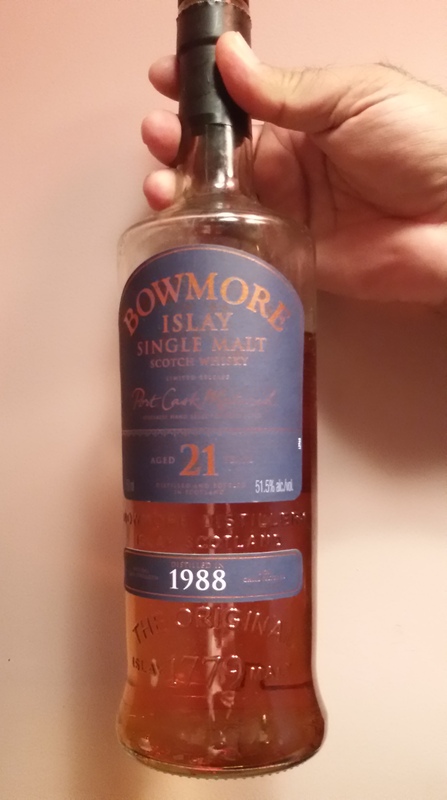 This entry was posted in Islay, Scotland and tagged Bowmore, Bowmore 21, Bowmore 21 review, Master Blender, Morrison Bowmore, Rachel Barrie by Carissa Hickling. Bookmark the permalink.